With the exception of the local/club judge, each level requires successful completion of the previous level. A judge with candidate status means they have completed the training but may need additional practical experience to complete the certification. Also for national, continental and international level judging, the governing body (or bodies) must recommend the judge for advancement to the next stage. Over the past weekend, we hosted a provincial archery judging clinic at our home instructed by International judge, Randall Jones. I want to congratulate my father who is now a provincial judge candidate with the successful completion of the course and passing the exam. He will now need to judge three tournaments including one indoor, and one outdoor with one major tournament such as Ontario Target Championship to become a certified provincial judge. If you are interested in becoming a Ontario provincial judge, the next judging clinic is being hosted by Archers of Caledon in May 11th and 12th. If you are interested in becoming a provincial judge, contact the Ontario Association of Archers for more information. One of the main reasons I started this blog was to help beginner archers find archery information. The biggest challenge I found starting out was getting information about various tournaments, equipment, etc…. thankfully I have an extremely helpful and knowledgeable coach who helped me find the information I wanted. A lot of my readers are beginner archers and utilize this blog and many others to find archery information. Do you know other locations to find reliable archery information besides blogs? For Field Archery the Worldwide governing body is the International Field Archery Association. The IFAA is an archery association that was founded 1970 when a group of field archers from the USA, Sweden, England, Scotland, Wales and Canada agreed on a set of basic rules by which Field Archery tournaments would be run. The IFAA now represents over 50 000 field archers in over 40 member countries from all continents. Additionally, the International Bowhunting Organization (IBO) that was created in 1984 by a dedicated group of bowhunters who shared the desire to ensure that bowhunting and the ideals of wildlife conservation will survive, expand and flourish to be shared, enjoyed and passed on to future generations. For North Americans there are a couple of major archery associations including the Archery Canada (formerly known as the Federation of Canada Archers or FCA). Archery Canada is members of both the World Archery Association and International Field Archery Association and is composed of nine provincial archery associations including British Columbia, Alberta, Saskatchewan, Manitoba, Ontario, Quebec, New Brunswick, Nova Scotia, and Yukon. Archers who are members of the provincial clubs are automatically members of Archery Canada and are eligible to participate in national tournaments. In the United States, there are separate associations that are affiliated with the two major organizations. USA Archery is the member of World Archery Federation and the National Field Archery Association is the member of International Field Archery Association. Each USA association are comprised of state archery associations. Additional USA Archery has a special Junior Development Program known as JOAD. The Junior Olympic Archery Development (JOAD) is a program of USA Archery that teaches archery to young people, provides great opportunities for awarding achievement, and helps archers to enjoy the sport recreationally or progress to the excitement of competition! At the local level, most archery clubs are affiliated with an Archery association and can provide information about national membership, opportunities for development, upcoming tournaments, and provide insight and order various archery equipment. To find an archery association in your area, start with the Wikipedia national members for World Archery Federation and for local clubs in your area try searching the web. Please continue to visit my website for all kinds of information about archery, training, tips and tricks, upcoming tournaments and all things archery and continue to ask any questions you may have. From February 16th to February 24th Ontario will be holding the second of the two annual indoor provincial championships, the indoor 10-ring Target Championships. Similar to the indoor Field Championships, this annual tournament is hosted by many sites across the province with mail-in scoring. It was at this tournament that I won my very first medal at 12 years old, although I didn’t find out until two-months later at my archery club’s Annual Awards Ceremony because my parents wanted it to be a surprise. The target championship is an indoor FITA tournament and is the standard format for the Canadain National Indoor Championships and all World Indoor Championships. The tournament follows standard FITA rules using a 10-ring 40cm target ( 60 cm for Cub and Pre-cub Recurve) with two rings each of Gold, Red, Blue, Black and White and everyone shooting from 18M. Consistent archers may choose to use a vertical 3 spot to avoid breaking arrows and nocks. A vertical 3-spot is also mandatory for all Indoor World Championships. With mail-in tournaments there are no elimination rounds where archers have head-to-head competitions. With the updated FITA target faces in 2012 there is no X ring anymore therefore ties can happen. This tournament is typically the start of the premier shooting period in Ontario with the national indoor championships at the beginning of March and then COPARCO Multi-national Indoor Championships of Americas (North and South America) mail-in championship to follow. If you live in Ontario and have never competed in an indoor target championships, check out the Ontario Association of Archer’s website for host site and dates near you. Just got back from this year’s Canadian National Field and Target Championships held on beautiful Vancouver Island in British Columbia. This year I travelled with my coach Kathy Millar from South Nation Archery Supply and without either of my parents. The Field Championships were hosted by Cowichan Bowmen Archery Club which is considered the best field course in all of Canada. The course is both beautiful and challenging with large rocky hills, angled trees, and other mind illusions. According to my coach it is pretty close to world level field tournaments. I also had the honour to shoot with my World Indoor Championships teammates Virginie Chenier and Caitlin Northey and I was fortunate enough to placed third. The Target Championships were hosted at the West Shore facility consisting of both a FITA 1440 on day one and a FITA 720 on day two. Day one was not the best shooting day for me; the wind was tricky, I was not feeling the best, and I had an equipment failure where my arrow rest came off. On day two, the FITA 720, I was still a little shaken up from the FITA 1440, but I had a much better shooting day. Although I did not medal, I did come back with a lot more mental experience and a lot of fun memories. The National Championship trip also provided me with a HUGE surprise. In 2011, the Gunter family established an annual bursary for Canadian junior archers to be awarded at the National Championships. The WW Gunter Memorial Bursary is awarded annually to a Canadian Archer between the ages of 15 and 20, who has competed or will be competing for Canada at a World Championship or international archery competition such as the Youth Olympic Games, and who is planning to continue their education at the post-secondary level. The archer must conduct themselves in a manner that is a credit to their sport, their country and always maintain a sense of dignity and sportsmanship in victory and defeat. To say I was surprised when they announced that I would be this years recipient would be a massive understatement. I was in such disbelief, my coach, Kathy actually had to nudge me to go and receive the award. I am humbled that the Gunter family would endow me with such an honour and I thank them enormously. In September 2011, a friend of mine Peter Garrett, shocked the World and became Canada’s First World Champion in Instinctive Archery capturing Gold at the World 3D championships in Austria. Recently, Peter agreed to participate in an interview describing his experience and what it was like to reach the top of the podium for Canada. Jordan: Congratulations again Peter, first can you give our readers a little information about your shooting background. What got you interested in archery and at what age? Peter: When I was 49, I moved to Kitchener and joined the Elmira Rod and Gun in 2004 so I could continue my pistol shooting that I had been doing for 25 years. My 11 year son saw the rubber 3D animal targets there and wanted to shoot at them so I bought us each a bow and started archery. After 3 years my son lost interest but I loved it and shot my first provincial championship in 2005. Jordan: As you are aware North America is dominated by compound bow shooters, what made you want to shoot bare bow and instinctive? Peter: I started out with an unsighted compound bow but there was hardly any competition, so I switched to a recurve bow as there was lots of competition and I could always put sights on it and make it an Olympic style bow. Jordan: What inspired you to “take it to the next level” and compete on the national and international level? Peter: I won my first provincial championship, something I had never accomplished in 25 years of pistol shooting and it really inspired me. The next year the 3D Nationals were held in Ontario so I attended it and won as well. As there was nowhere to go in unsighted compound, I switched to an instinctive bow and have been enjoying it ever since. Jordan: What is your typical practice routine & how often do you practice? Jordan: How do you prepare both physically and mentally for an international match such as the World 3D championships? Peter: I won two 3D National Championships and had a chance to represent Canada at the World 3 D Championships in Italy in 2009. When I got there I realized how poorly prepared I was. They had different rules, most of the other countries had full sponsorship and they trained 2 to 3 times a day. I was so nervous I missed 3 of my first 4 targets, I hit the next 36 but it was too late and I finished 2nd last. I decided if I went again I would be properly prepared. The 3D worlds are held every two years, so I learned all the rules and started training twice a day in September 2010. I was shocked in December 2010 when World Archery announced a rule change that banned my 3 finger under the arrow grip and made a split finger grip mandatory. I had to change my bow and relearn the way I shot in order to meet the new rules. I got a loaner riser from Lancaster Archery and started practicing 2 to 3 times a day in early January and kept that up until the end of August when I went to the worlds in Austria. Jordan: I hear that bare bow and instinctive are far more popular in Europe, what was it like competing in the World 3D championships? Peter: In Canada in 3D, there are about 15 compound archers for every non compound archers. In Europe there are 5 non compound archers for every compound archer, a huge switch. On our Canadian team 6 of 8 archers shot compound bows but their practice area was ¼ the size and number of targets as mine for non compound archers. There is a lot of prestige associated with the non compound archers and the best of the best were in attendance. Both French and Austrian archers told me about 100 archers tried out for their countries 3 Instinctive positions at the Worlds. Canada only had myself in Instinctive and Brock Patton in Longbow. Peter: I practiced hills by occasionally going to a ravine near by and shooting at any club I knew had a lot of hills. The Flying Feathers Club in Madawaska had the overall best variety of shooting conditions so I tried to go there whenever they had a competition or I was allowed to practice there. Jordan: Who are your coaches and how did they help prepare you for this journey? Peter: I did not have a coach for 3D Instinctive archery for a variety of reasons. I did receive help in the spring with general bowman ship and dealing with distractions from Kathy Millar. Larry Smith set up my new bow, figured out the best arrow to use and gave me some great training tips on judging distances. Jordan: Do you have any sponsors that have supported you through this adventure? Peter: Lancaster Archery had lent me a 17” Trad Tech Titan riser to try until their 19” was in full production. As the new riser was not released in time I used the 17” at the world championships. Since then Goldtip arrows and Trad Tech have helped me with my equipment as I used their product to win the World Championships. Jordan: What was the most memorable part of the whole experience? Peter: The most memorable moment was hearing my team mates and wife sing O’Canada from the stands as they raised the Canadian flag and played the National Anthem. I had great support from my wife and team mates throughout this event that made it extra special. Jordan: Now that you have succeeded in becoming World Champion, what are your new archery goals for the future? Peter: This is a great question, I stopped shooting completely for 3 months as I needed a break. I thought I might quit but I love to shoot archery and I have started again. In January World Archery changed the rules again so now I need to use a wooden bow and other significant changes that at this point I am not planning to relearn so I can shoot at the world in 2013. I am just having fun shooting right now and with retirement from work ahead in the near future I am not sure what I will do. Jordan: Would you be interested in doing a periodic blog now and then for our readers? Peter: I would be happy to and answer any questions someone may have. On Friday, Kiwanis Club of Kingston will hold its annual sport banquet and awards ceremony at the Ambassador Conference Resort. This year marks the 31st anniversary of the Kiwanis Sports Banquet that recognizes amateur athletes and teams in the Kingston area and district. Every year the banquet honors individuals, builders and teams and awards the prestigious Gus Marker Trophy to Kingston’s Amateur Athlete of the Year. 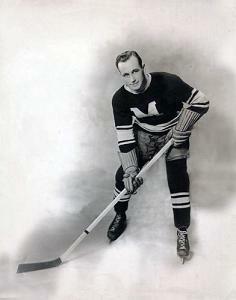 Gus Marker, last surviving member of the Montreal Maroons 1935 Stanley Cup championship team, was a long time Kiwanis member. He played ten seasons in the National Hockey League for the Detroit Red Wings, Montreal Maroons, Toronto Maple Leafs and Brooklyn Americans and after retiring to the Kingston area was an enthusiastic booster of amateur sport in the region. Past winners of the Gus Marker Trophy have included boxer Mark Leduc (1992), hockey players Alyn McCauley (1996) and Jayna Hefford (1997), golfer Matt McQuillan (1999), and triathlete Simon Whitfield (2000). This year nine finalists are in the running for the Gus Marker Trophy including Max Caron (football), Scott Harrington (hockey), Kerr Hutchinson (fencing), 2011 winner Augusta James (golf), Tyler Osborne (squash), Stephanie Rychlo (dance), Tyler Santoni (volleyball), and Alex Wright (BMX) and I was extremely humbled to be included as a finalist. This year’s banquet will also honour two builders and three teams. Builders include longtime Church Athletic League coach Ken Ohtake and Sydenham Golden Eagles track and field/soccer coach Leslie Lawlor. Teams include the National Capital Bowl champion Frontenac Falcons football team, the Canadian Interuniversity Sport champion Queen’s Golden Gaels women’s soccer team and the Ontario Federation of Sport Athletic Associations champion Holy Cross Crusaders midget boys cross-country team. If you are planning to be in the Kingston Area and are interested in attending the banquet, you call 544-1221 or 549-2020 for more information or tickets.